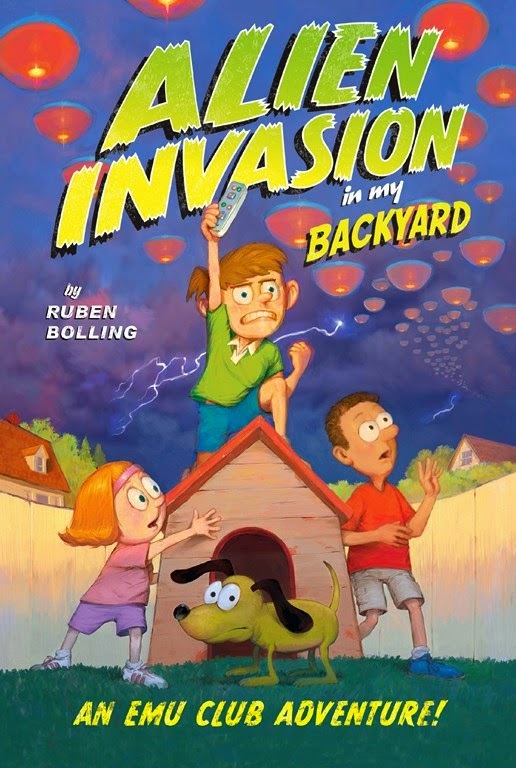 Alien Invasion in My Backyard (An EMU Club Adventure) is a preview copy from NetGalley! This book is about a boy named Stuart, his friend Brian, and his little sister Violet. They find out that their dog is a robot sending messages to aliens that the Earth has not been destroyed, but his computer is broken. The aliens come and the kids have to protect Earth from the aliens, but the aliens look like cats. Then the war starts! I thought this book was really funny and cool that the aliens were cats. My favorite part was when they used water guns to fight the alien cats. I liked that the dog was a robot but he risked his life to save Stuart. I think kids who like funny adventure stories would really like this book. I am really excited that it is a series and there will be another book.